George King Sutherland was born on 18th December 1888 at Treherbert. In 1891 he was living at 2, Gwendoline Street. By 1901 the family had moved to ‘Selma’, in Abercynon. George was educated at Pontypridd County School and later at the Higher Grade School, Cardiff. He was an engineer. In 1911, he is shown as living with others at Llwyn-On Farm, Cwmtaf, Near Merthyr Tydfil, employed as a civil engineer. There is a good possibility that he was involved in the construction of one or more of the seven reservoirs that occupy the Taf Fawr and Taf Fechan valleys above Merthyr Tydfil. When the First World War broke out in August 1914, George was swift to join as a volunteer and on the 28th September 1914 he enlisted into the Royal Naval Division. In 1915, he participated in the Gallipoli landings and was attached to the Royal Navy. The London Gazette, dated 29th January 1916 shows that, as of 30th January 1916, George was on temporary promotion to the rank of 2nd Lieutenant in the Corps of Royal Engineers. By the 20th July 1916 he had been promoted to the rank of Lieutenant, Royal Engineers, attached to the 197th and then the 196th Field Company and was sent to France and Flanders where he served with the British Forces there. On 23rd March 1918, George married Amelia Maud Parry at the Old Parish Church, Barry, South Glamorgan. They lived at ‘Lynwood’, Glancynon Terrace, Abercynon. I can find no trace of records that would suggest that they became parents. George was invalided home in October 1918 and died on March 9th, 1919. 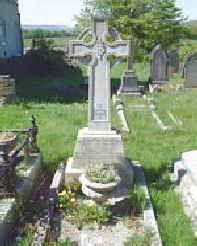 He is buried in the large family grave at Llanfabon Cemetery, Nelson. George is actually buried in the family grave that is just in view to the left of this memorial. Georgina Sutherland and four of her children. George is included. John died on 3rd August, 1928 and Georgina on 29th May, 1946. They are all buried in the large family crypt adjacent to George's memorial. Margaret Evelyn who was born about 1907. In 1911, the family home was shown to be at ‘Selma’ in Abercynon. Family photograph and some information kindly provided by Philippa Lowe, a great niece to George King Sutherland.